Alan Baxter, an unidentified man, and radio personality, radio personality Mick Dolan, on May 5, 2012, at the Shovelhead Lounge in Longwood, Florida. 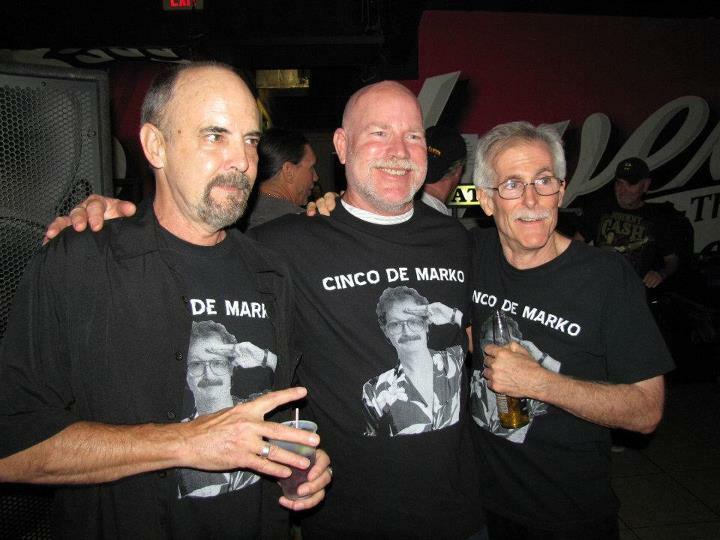 The three men are wearing black t-shirts with a photograph of Mark Samansky and the caption, "CINCO DE MARKO" printed on them. Baxter and Samansky co-hosted the "Baxter and Mark Show," which aired from 5:30 am to 10:00 am weekdays on 100.3 WDIZ-FM, from 1983 to 1992. Known for their twisted and irreverent sense of humor, extensive knowledge of rock music, and musical parodies, the pair performed on-air and at various small Orlando venues and was a staple of rock radio in Orlando. 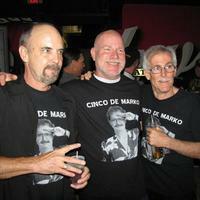 Samansky passed away in 2011, and "Cinco de Marko" became a celebration of his life, since he was born on May 5. Willis, Nicole A. "Mark Samansky: Radio antics hooked his audience." Orlando Sentinel (April 6, 2011). http://articles.orlandosentinel.com/2011-04-06/news/os-obituary-mark-samansky-20110406_1_baxter-and-mark-show-mark-samansky-rock-station (accessed May 28, 2015). Dolan, Mick. “Alan Baxter and Mick Dolan.” RICHES of Central Florida accessed April 20, 2019, https://richesmi.cah.ucf.edu/omeka/items/show/5198.